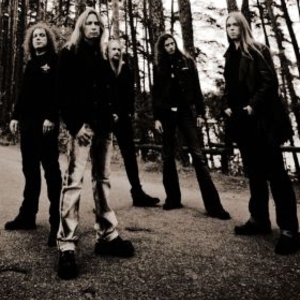 Stratovarius is a power metal band from Finland. They became popular in the '90s, and throughout their career have inspired upcoming power metal bands with their baroque arranged keyboard solos & Ritchie Blackmore-like guitar portions. Stratovarius was founded in Finland in 1982 from former members of the band Black Water. They went through a number of personnel and musical changes before the band found its own voice. The founding members were Tuomo Lassila, Staffan Str?hlman and John Viherv?. Stratovarius was founded in Finland in 1982 from former members of the band Black Water. They went through a number of personnel and musical changes before the band found its own voice. The founding members were Tuomo Lassila, Staffan Str?hlman and John Viherv?. In 1983, the name was changed to Stratovarius (a portmanteau of Stratocaster and Stradivarius), an idea of Str?hlman's. By 1984, Timo Tolkki entered the band, replacing Str?hlman in the guitar. He took up the vocal duties as well. Tolkki became the driving force and mastermind of the band assuming almost complete control of the song writing. He brought along not only strong rock influences but also a neo-classical tinge. The band released a demo to various record companies by 1987, finally being picked up by CBS Finland. In 1989, their debut album Fright Night was released followed by two singles. After being dropped by CBS the band went through several member changes but they managed to release on another label and they also toured a bit. In 1994 they released their third album, Dreamspace, featuring new bass player Jari Kainulainen, (who joined the band when 70% of the new material was already recorded) which was a great success. Tolkki decided to stop singing for the band and they hired a new full-time singer, Timo Kotipelto. The release of Fourth Dimension in 1995 was a great success, but internal differences in the band particularly about the style the band was going for, prompted the departure of long-time drummer Tuomo Lassila and keyboardist Antti Ikonen. Two new non-Finnish members were recruited: Swedish keyboardist Jens Johansson of Yngwie Malmsteen fame; and German drummer J?rg Michael. With the fifth release Episode, Stratovarius had finally found its sound and had a strong, diverse line-up. Episode was a grand project featuring a large choir and a string orchestra. It spawned some of the all-time greatest Stratovarius hits, such as "Father Time" and "Will The Sun Rise". In late 2003 the band broke up with Timo Kotipelto and J?rg Michael leaving after a very vaguely explained conflict. Tolkki hired a new singer, Katriina ''Miss K'' Wiiala, and Anders Johansson of Hammerfall (Jens's brother) temporarily on drums. Tolkki's behaviour rapidly began to become extremely strange. He published a long news article on the band's website, detailing how he had converted to Kabbalah after reading Madonna's autobiography and being contacted by Jesus himself. He wrote extensively on the principles of Kabbalah but according to some Jewish forum members, this has nothing to do with any actually practised form of it. The webmaster removed the news article from the site. Then Tolkki even stabbed himself in the shoulder first claiming that a crazy Spanish fan had done it because of band had broken up. Tolkki also phoned Anders Johansson, speaking nonsense about Adolf Hitler ? Anders freaked out and left the band. Nobody really understood the situation and fans were worried about Timo's mental condition. In April 2004 he was hospitalised with chronic depression and a nervous breakdown and, after being released from the mental hospital, negotiations and attempts at reconciliation with the rest of the band began. The rest of 2004 was virtually complete silence from the band. Early 2011 saw the release of their new album, Elysium, containing the songs that were written during the Polaris tour.